You find recipes in the funniest places! As I was growing up my mother occasionally swiped my kids magazines, why you might ask, she found a good recipe. Oh yeah she found a sour cream pancake recipe in one of my children’s digest magazines which was phased out in 2009. Well even fiction and mystery novels have recipes in them now. A number of authors have taken to adding a theme to their books that have food in them. It’s easy to find out who writes those on the web. The Dragonlance series of books came out in the 1980’s. The series added two source books, Leaves from the Inn of the Last Home and More Leaves from the Inn of The Last Home. Both books contain some wonderful recipes. Cookies, cake, bread, stews, vegetable dishes and more. Some granted you had to make some small changes unless of course you like lizard, lol. One of my all time favorites is Fizban’s Fireball Chili. The Original recipe goes like this, 1 pound beef cubed to 1 inch squares, 2 tablespoons flour. Marinade: 1 teaspoon Worcestershire sauce, 2 tablespoons paprika, 1 jar Tabasco sauce, 1/2 teaspoon Chinese hot oil, 2 teaspoon crushed red pepper. One of the changed versions. 1 pound beef cubed into marinade of 8oz bottle Tabasco, 3 tablespoons Worcestershire sauce, 2 tablespoons paprika, 1 tablespoon cayenne pepper, 2 teaspoons crushed red pepper. Put together and marinade 24 hours to two days. 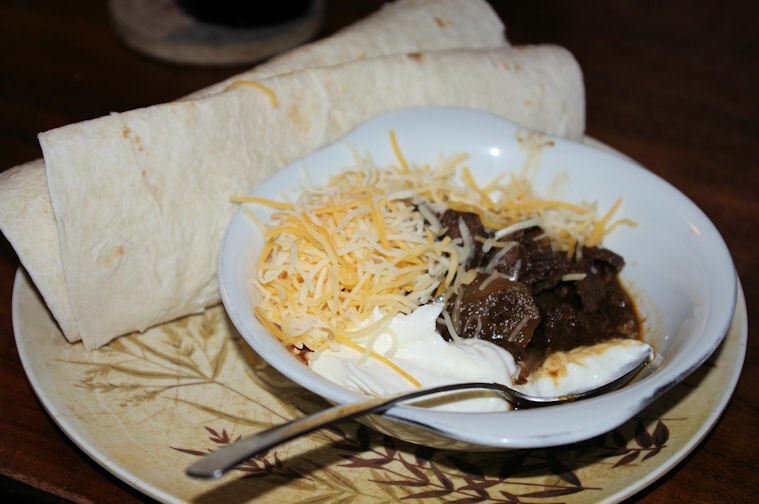 Then in dutch oven or heavy pot add a little olive oil and cook one sweet onion chopped with banana pepper and a couple bell peppers and the marinade and beef and slow cook.When it’s done serve with sour cream, a fresh lime and tortilla flats or elven flat bread (recipe to follow). Another version of this recipe can be found here. I once added dark kidney beans and it was still a hit but be warned it’s called fireball for a reason. The flat bread recipe also comes from this book and it’s I like the alternative version they also have in the book for the flour used. 2 1/2 cups flour (white, or 1 cup white and 1 1/2 cups rye or whole wheat), 1 package dry yeast, 1/2 cup warm water mixed with 1 teaspoon sugar, 1/2 cup warm water mixed with 1 teaspoon salt. Gently sprinkle the yeast into the warm water with sugar, let stand about 10 mins then add the salt water and mix with one cup flour, once fully mixed and remaining flour. Knead dough for about 10 mins, then make about 6 potions roll out to a 1/2 to 3/4 inch circle and place on greased backing sheet . At 425 degrees bake until lightly brown around 8 to 10 mins, or you can fry them in a skillet, I like this method better. Served with a good Ale or dark Stout. A stew with a little bite. This will make 8 servings and take about 3 hours total time. 14-ounces Stout beer of your choice i.e. Guinness, Master Thief, etc. Brown beef in a large Dutch oven with 1 tablespoon olive oil. In small bowl mix all the seasoning (except bay leaf and thyme) to flour, when the beef is brown and beef to flour mixture in bowl and set aside. Add olive oil to Dutch oven and lightly brown onions and garlic. Add a little Master Thief to get all the good stuff from the bottom of the Dutch oven. Mix back in the beef and Master Thief plus the tomato paste. Add beef stock and Worcestershire, bay leaf and thyme. Let simmer for an hour. Add carrots and potatoes and simmer till potatoes are done. Don’t forget to take out the bay leaf afterwards. Server with warm bread and have a wonderful feast. A salad for a starter and some beer to go along makes a nice addition to this meal.